Wolfram von Eschenbach’s 13th-century epic poem Parzival, like most of the Arthurian texts of the Middle Ages, is a rambling, episodic tale. Wagner first read Parzival in the summer of 1845, as an embattled 32-year-old Kapellmeister. Nearly forty years later he presided at Bayreuth, in the last summer of his life, over the first performances of his Parsifal, the strangest and most inward of all his works. What was it in Wolfram’s poem that attracted him in 1845, and held him to this subject? Two stage pictures had caught in his mind: the moment at which Parzival, innocent and brash, blunders into the Grail castle and sees Amfortas; and the arrival of Parzival, now a knight concealed in his armour, in a forest clearing where he is asked by a forlorn old man why he is bearing arms on Good Friday. To invent a dramatic plot that would connect these scenes with each other was Wagner’s task, subconsciously and consciously, of many years. And inspiring this task throughout its long course was the underlying subject of Wolfram’s whole poem: Parzival’s faithfulness, through many adventures and much tribulation, to his eventual return to something – the Grail – that at first sight he has understood not at all. The plot Wagner eventually arrived at, in which Parsifal undergoes the very temptation to which Amfortas has yielded, and, by resisting it, is able both to cure him and to succeed him as lord of the Grail, was entirely his own. Once Wagner the dramatist had glimpsed the symmetry by which his third-act confrontation of Parsifal and Amfortas could echo that in his first act, with the wisdom Parsifal has learned having transformed him and enabled him to heal Amfortas, the problem that remained was how to give the transformation, which must take place in the second act, its due load of emotional conviction. Wagner’s solution is astonishing. It came to him during the tempest of work that produced Tristan und Isolde between 1858 and the summer of 1860. By this time he had read Schopenhauer’s Die Welt als Wille und Vorstellung (The World as Will and Representation), the key intellectual experience of Wagner’s career. Schopenhauer confirmed for him his own sense of life as a constant conflict of competing wills and desires, which could be escaped only in the disengagement of renunciation. His old obsession with redemption through love was now changed, almost reversed, into an obsession with redemption through renunciation, above all renunciation of love. It was no doubt the intensity of Wagner's work on Tristan, together with the influence of Schopenhauer and his own noble – as he saw it, for once with some reason – renunciation of Mathilde Wesendonck, that gave him the answer to his Parsifal problem. For the answer was a woman, her seductive beauty yielded to by Amfortas, but resisted by Parsifal, who as the result of his resistance but also of his fellow-suffering (Mitleid) is able to heal Amfortas and restore the damaged community of the Grail knights. By 1865, when Wagner wrote the full prose sketch of Parsifal in four days, all the essentials of the work were in place. 12 years later he wrote the Parsifal libretto, in all respects a faithful development of the sketch, in just over a month. The composition of the music took two more years; the complete score another three. A young man’s instinct for the possible dramatic and psychological weight of a couple of scenes in an antique poem had at last become an old man’s masterpiece. The complete version of Lucy Beckett's article, along with several other articles on the themes and music of Parsifal, can be found in the programme book, available for sale in the theatre at performance times and from the ROH Shop. 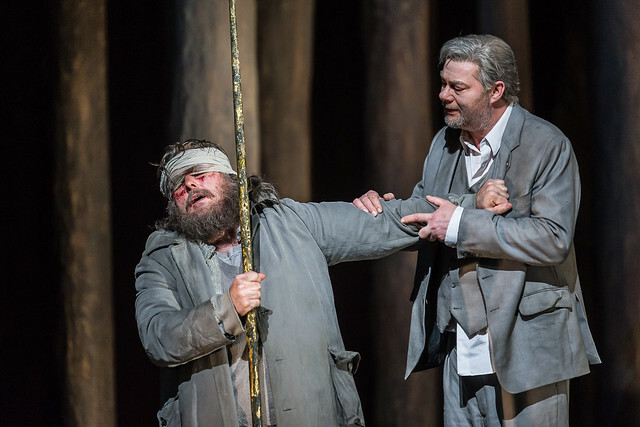 A very good article; what a tragedy that the Royal Opera continues, with its new production, the trail of disastrous productions of Parsifal beginning with Hands, followed by Bryden and then Gruber. This new attempt is 50% tedious (the huge cube obstructs rather than assists; everything has to fit in around it, and the mini-tableaus are rather pathetic. And what is it about 1950s NHS hospital beds that appeals to so many "cutting edge" directors? ), 30% incomprehensible and 20% repulsive (a blood ritual after gashing a naked boy? It served no purpose, unless it was a reference old anti-semitic libels.) This did not reveal anything deep in Wagner's masterpiece; rather it obscured it. The audience should not be patronised like this. In case you think I'm a reactionary traditionalist I will add that Lehnhoff's production for ENO is superb! I just saw a performance at a movie theatre and agree completely with the comments about the staging. Using a bed in a cube in the middle of the stage as the focus of the action shrinks the stage to a postage stamp. Using a virtually naked boy as a source of holy blood is ghoulish. Numerous other staging problems. But the music was great.